The answer is easy! You don’t. Your baby does! Humans, just like other mammals, are born with an innate ability to breastfeed on their own. It’s the mother’s job to place the baby in a position that will allow him/her to have the best access to the breast milk. Once in position, the baby will need to be able to achieve a proper latch. This will result in optimal comfort for the mother and ample milk for the growing baby. The NBCI provides tons of great videos you can use to watch and learn! Chewing/sucking on hands or fingers. Crying is a late indicator of being hungry, and so a baby’s signs of hunger should get attention before this happens. Most importantly, breastfed babies regulate themselves, and, so, it’s best to follow their lead. Pay attention to their signs of hunger and allow them to take what they need at each feeding and from each breast. A good rule of thumb, according to The American Academy of Pediatrics is that healthy, full-term newborns should breastfeed about eight to twelve times in each 24-hour period. Remember "8 or more in 24!" There are a few signs to look for to ensure your baby is getting enough breast milk. Two easy signs include the number of diapers wet in a day and the number of bowel movements in a day. Wet Diapers: During the first few days of breastfeeding, while the milk is still being made in the form of colostrum, typically only 1-2 diapers will be wet per day. By about the 3rd or 4th day, once the colostrum has stopped and less thick milk has started, 5-6 disposable diapers should be wet per day (6-8 if they are cloth). Bowel Movements: Most infants will have at least 2-5 bowel movements in a day, for the first several months. Some infants will start to have less frequent but larger bowel movements at about 6 weeks. The baby nurses often, averaging at least 8-12 feedings per 24-hour period. Baby's swallowing sounds are loud enough to hear as he is breastfeeding. The baby should gain at least 4-7 ounces per week after the fourth day of life. Babies lose weight in the first few days of life as your milk comes in. Don’t worry! This is normal and there is no need to supplement with formula. How long should/can I breastfeed? pureed baby foods. To continue giving your baby the benefits of breast milk, continue breastfeeding to at least 12 months of age, and for as long as desired by both mother and baby. How do I pump and store milk safely? Wash your hands well with soap and water each time before you pump your milk. Use a nailbrush to clean under your finger nails. Pump your milk into a clean food container. If you are hand expressing, a large mixing bowl works well because the milk may spray in many directions. After expressing or pumping, wash and rinse everything that has touched the milk. a separate door from your refrigerator, for 3 to 4 months. Keep your milk in the middle of the upper shelf, not on the bottom and not on the door. Use old frozen milk over formula. Label and date the bottles to use the oldest ones first. Store pumped milk in the amount your baby takes at a feeding. If your baby is under one month, store in 2-ounce amounts. Thaw one container of milk at a time. If the baby wants more, another container can be thawed quickly. the refrigerator, then you can add it to the frozen milk. It is important not to put warm milk on top of frozen milk. To thaw your milk, place it in the refrigerator for a day. For a quick thaw, take the frozen milk container and run it under warm tap water or place it in a bowl of warm water. Do NOT use a microwave to thaw milk; the uneven heating can hurt a baby. Remember to swirl the milk because the cream separates and needs to be mixed with the rest of the milk. Once warmed, whatever the baby does not drink within an hour should be thrown away. 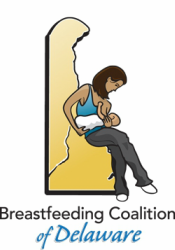 Delaware child care centers must, by law, support your decision to breastfeed. The breast milk you send in with your child can be stored in a refrigerator along with other foods and should be labeled with your child’s name and the date.